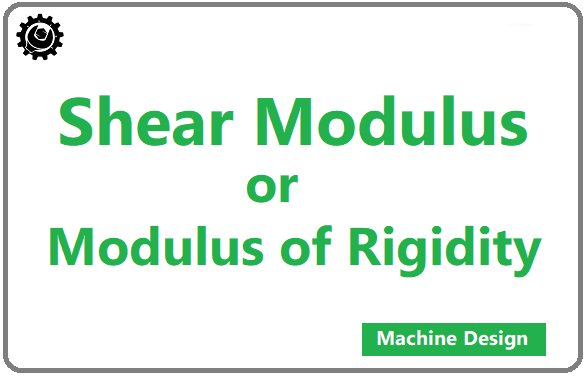 Shear modulus is also known as Modulus of rigidity. It is the coefficient of the elasticity to shear force. In this article, we have discussed the shear modulus briefly with an example along with the modulus rigidity of most commonly used materials. Let’s assume a block as shown in the figure. The bottom face of the block is fixed and on the top face, a force F is acting normally. Then there will be a deformation in the block and the face tend to displace to a new position. 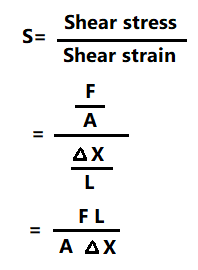 Shear strain will be the displacement. 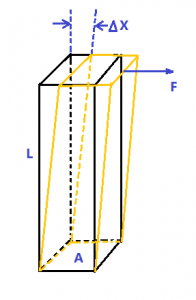 The shear modulus is the elastic modulus we use for the deformation which takes place when a force is applied parallel to one face of the object while the opposite face is held fixed by another equal force. A material having a bigger shear modulus that means it will have high rigidity. So that’s why we call it as modulus of rigidity. Due to the deformation, There is an approximation that “there is no change in volume in the deformation. Here are the modulus rigidity of the most commonly used materials. Interersting report. Good material to introduce to our AP physics or chem classes. I will mention it to the technology education teachers. This might give the kids a chance to see how these concepts are used in the “real world”.